Our lists of Derek Carr Fantasy Football Names isn’t just a passing fancy. You’ll find some fun puns and a play on words (or two) that will work for a Derek Carr-led fantasy team. This Fresno State grad has been at the helm for the Raiders that last couple of years and been performing admirably. He’s the younger brother of former NFLer David Carr. 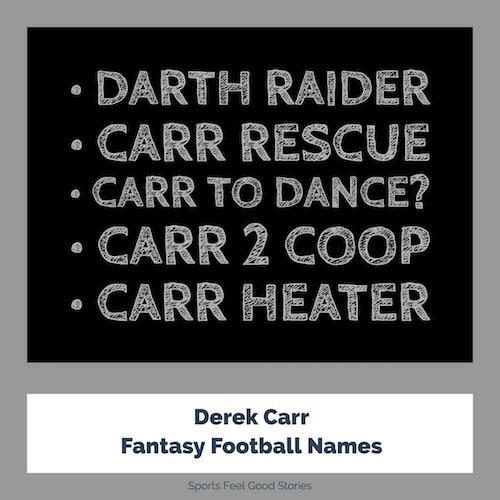 Check out this Derek Carr Fantasy Football Team Names. What number did Derek wear at Fresno State and why? Carr wore number 4 at Fresno State as a tribute to his favorite player, Green Bay Packers’ Brett Favre. In 2013 Carr won the Sammy Baugh Trophy awarded to the top collegiate passer. Fellow Fresno State alums brother David and Trent Dilfer also won the award. Carr was 8th in Heisman Trophy votes his senior year. Check out all the Raiders Fantasy Football Names by Clicking on the Helmet above. Baby, you can drive my Carr. That takes Carr of That. • Carr has tattoos on both of his wrists. One is of Chi Rho representing Christ and his resurrection and the other is a biblical verse from the Book of Jeremiah. • In 2016, Carr led the Raiders to their first playoff game since 2002. A leg injury prevented Carr from competing in the playoffs. • Carr has an interest in one day attending seminary school. • Carr can play the guitar, piano and drums. He’s a virtual one-man band. • His dog is named Bruce Wayne. It’s a Golden Labrador.